The Alarm Isolation Unit (AIU) is a 6 channel alarm isolator unit for �hot site" isolation of alarms on high voltage and medium voltage plants. The isolator is intended to be used to isolate DC alarm contacts on �hot� equipment via field wiring with the electronic inputs of monitoring equipment (SCADA, PLC). Potentially under fault or flashover conditions the field sensing contacts can be raised to many thousands of volts above ground potential, which would damage low voltage monitoring equipment. The alarm isolator unit is mains powered with a nominal 50V DC feed to remote alarm contacts via field wiring. These contacts in turn activate the isolated relays in the alarm isolator. Up to six isolator relays can be fitted to the DIN rail in the unit, and easily replaced if required. 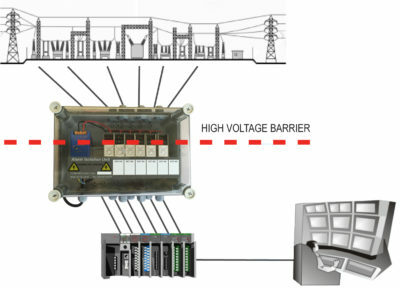 The unit will operate on field wiring up to a maximum loop resistance of 1000 ohms. Our service portfolio is tailored to each individual customer’s needs. We aim to offer complimentary services to our customers to help them deliver the service level agreements they are contracted to provide.